Recently, I found myself pouring through dozens of website posts comparing watches used by long distance runners. This year I am pursuing, perhaps in vain, a new PB at my favorite 10K; this will require a boost from technology. Now, if I have learned nothing in the last decade working with measurement instrumentation, it is that if a process can be measured, it can be improved. Understanding those measurements can be a challenge. Repeatedly, bloggers on running sites have been asking if the race course mileage should closely match the mileage on a GPS watch. Reminding me, no matter the application, a key selection criterion for a measurement instrument is accuracy. Accuracy is the deviation of a reading when compared to a standard. In general, better accuracy requires higher instrument costs. However, too little accuracy and process efficiency, production costs, and user satisfaction may suffer. So many users want to know, “What is the accuracy of my thermocouple vacuum gauge”? In this blog, I will discuss the accuracy of thermocouple vacuum gauges. In the low to medium vacuum range, many users select thermocouple vacuum gauges for their long-life, rugged performance, and low cost. Typical applications in the low to medium vacuum range include lighting, monitoring cryogenic jackets, vacuum pump performance, and HVAC/refrigeration. In order to better understand the accuracy of a thermocouple vacuum gauge, it is helpful to review the response curve of these vacuum gauges. In the accompanying figure, we show the output of three of Teledyne Hastings most popular vacuum gauges. 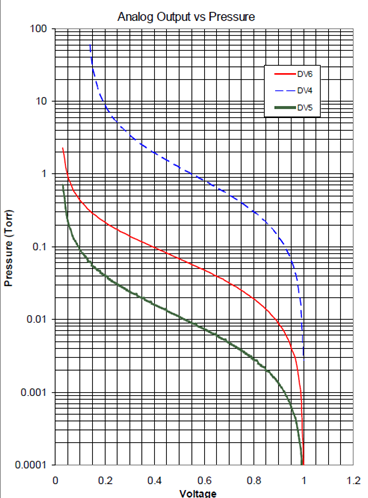 Note that each vacuum gauge tube family (DV-4, DV-5, and DV-6) has a range of pressures where the sensitivity, defined as the change in output as a function of pressure is very good. In this pressure region, the output is very repeatable and gives the best accuracy. Note that at the far ends of the curves, the sensitivity flattens out which in turn causes more uncertainty in the pressure measurement. So in general, the best accuracy of the thermocouple gauge is found in the middle of the curve. This fact can help the user select the best vacuum gauge tube family for a given application. Note that the measurement accuracy reflects the gauge as a whole system (meter, cable, and thermocouple gauge tube) and not the individual components. (So, it does not make sense to ask, what the accuracy of a thermocouple gauge tube is.) Users can look up their pressures by reading their output voltages. The voltage shown here is an amplified signal derived from the thermocouple output. It might be helpful at this point to review some of the factors that can affect thermocouple gauge accuracy. The accuracy statements shown in the chart above are for nitrogen. Since thermocouple gauges are gas species dependent (in other words, the output that the gauge will give will depend on the composition of the gas for a given pressure), the use of the gauge in gases other than nitrogen will affect the accuracy. Also, the condition of the gauge tube is important. A gauge tube that is contaminated with pump oil and/or process material may not provide the expected accuracy. Temperature variations can also cause changes in thermocouple gauge output. Applications engineers at Teledyne Hastings are available to help you understand these effects. We would like to hear from you. Contact us with your vacuum experiences. Vikki Jewell is a part time 10K runner and a full time applications engineer at Teledyne Hastings. She has been helping users of scientific instrumentation for twenty years. Vikki can be reached at victoria.jewell@teledyne.com or hastings_instruments@teledyne.com.